A quick and easy baby hat pattern. 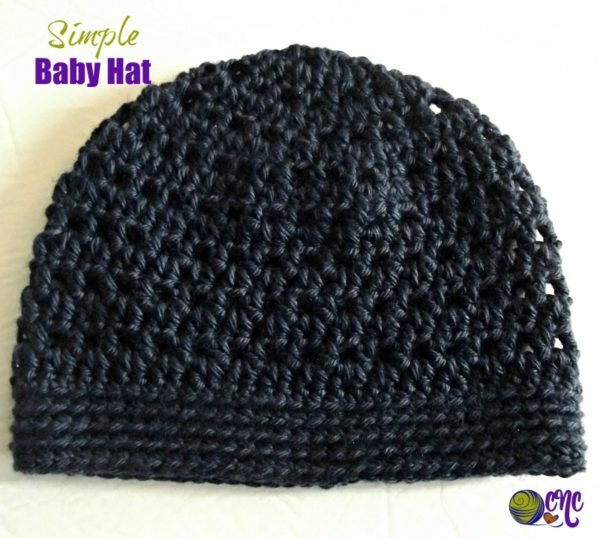 This baby hat pattern is worked off the Simple Ponytail Hat. It is designed to fit a 12 month old baby. Although shown in a dark blue, I would say this hat is more fitting for a baby girl. The pattern has a bit of an open stitch pattern, which makes it perfect for a bit of extra warmth in the cooler weather. For really cold weather you could insert a lining on the inside if you wish. If you need to adjust this size, you can increase or decrease the size of the diameter. Gauge: Approximately 1.5″ over first 2 Rnds and 3″ across 13 sts at the brim. Finished Size: Laying flat it measures 7.5″ across the brim and 6.5″ high. Rnds 11-17: Rep Rnds 9 and 10, ending last Rnd with Rnd 9. Rnd 18: Ch 1, sc in same st as join and into each st around; join with sl st in first sc. Rnds 19-22: Ch 1, blsc in same st as join and into each st around; join with sl st in first blsc. Fasten Off. You can use the green print friendly button below each post to print or save them to your computer.